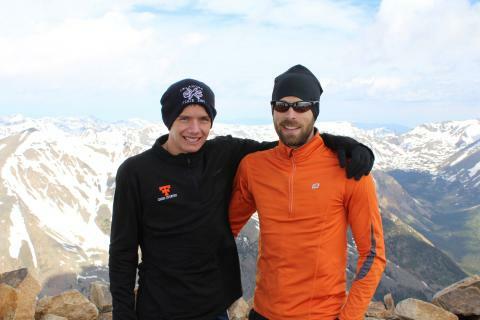 In the summer of 2011, a senior athlete on my cross-country and track teams, Ben, really wanted to experience the mountains of Colorado and asked if I would take him. Who would pass up a chance to go to the mountains? Naturally, I agreed. We spent 10 days camping, hiking and whitewater rafting. It was a great trip. I came away not only with great memories, but with a great lesson as well. Near the end of our trip we decided to climb Mt. Elbert (14,439 ft.) in Leadville, Colo. The hike started just after 6 a.m. as we meandered through the forest before the ascent really began and the trees started thinning (along with the air). Once above the tree line, we got the first glimpse of the awesome view but could also see that our beautiful day might be short-lived. Storm clouds were on the west horizon. We hiked on knowing that we had to keep moving in order to get down the open face before the storms moved in. As we climbed, the clouds continued to roll in. The peak was snow-covered and visible against the clear blue sky at first. Slowly we could no longer differentiate where the peak ended and the clouds began. The wind picked up; the temperature continued to drop; our pace slowed due to the terrain and altitude; and my morale began to fade as well. At that moment I turned around to head down the trail and that is when I was hit with a lesson that resonates still to this day. Ben was 30 yards behind me on the trail when I turned. I saw him with his head down, focused on the trail and task before him. Just as I had seen him demonstrate day after day in practice and in competition, he was committed to seeing this through to the end. At that moment I realized I was not out there for me. I was out there for him. I was there to assist him in the act of striving and reaching for his goals. I waited for him on the trail and stepped in behind him as he passed me. My will renewed, I followed him up the mountain, keeping my reason for being there in my immediate field of view. Not 60 seconds later, we were standing atop the tallest mountain in Colorado. The discouragement had gotten so strong that I was ready to call it a day; yet I was so close to my goal. Teaching can be a lot like this story. There will be times that the act of teaching will wear you down to the point you contemplate quitting. If you can recall in those moments your professional passion, the reason you chose to enter this profession, I promise you will find the will to move on. You will find that your peak is just around the corner, and you will be reminded all over again why this is the greatest of all the professions.